Acquired from the family of the above by the present owner in 1972. 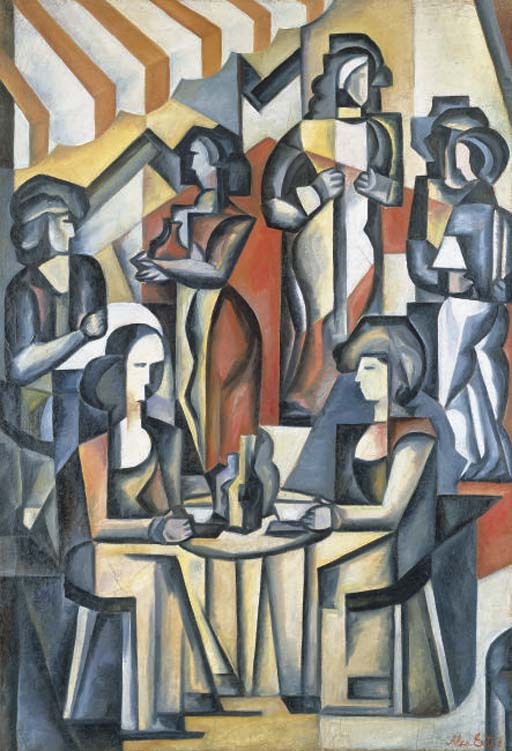 Au café is one of a series of works on the same theme that Alexandra Exter painted in the mid-1920s at the height of her involvement with the Purist movement. A heroine of the Russian avant-garde movement during the 1917 revolution and a former teacher at the Vkhutemas (the higher art and technical studios art school set up by the Revolutionary government), Exter was also known at this time as the 'Russian Léger'. After her emigration to Paris in 1924, Exter had renewed an association with Fernand Léger that had begun as early as 1912, and joined his Académie Moderne where she taught throughout much of the 1920s. Exter's paintings on the theme of people frequenting the café are part of a cohesive and harmonious vision of man and modern life propagated by the Académie Moderne. While Exter did not share many of Léger's 'machinist' views, she did subscribe to the central aim of the Purist group and that of the Vkhutemas before-hand of integrating man and modern life through constructive and functional art and design. Many of her ballet designs of the early 1920s had explored this theme and alongside Léger and Ozenfant in the mid-1920s, she began to articulate this vision in Cubistic paintings in which the human figure is integrated into a cohesive patterning of abstract form and colour. A prism-like structure that constructs a spatial play of form at its centre, Au café is by far the most accomplished of several works on this theme. With its complex yet refined resolution of abstracted form combining into a carefully constructed and harmonious whole, Au café is clearly one of the finest achievements of Exter's Purist period. Please note that the authenticity of the present work has been confirmed by Jean Chauvelin and Georgii Kovalenko. The work will be included in the forthcoming catalogue raisonné being prepared by Jean Chauvelin and Nadia Filatoff.